ROUND PREVIEW: Six hopeful teams play the first leg of their Men's EHF Cup quarter-final this weekend. Their aim is to join host Frisch Auf Göppingen in the LIQUI MOLY EHF Cup Finals in May. 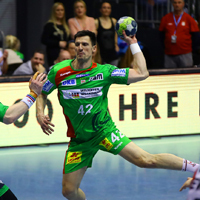 FEATURE: SC Magdeburg hope to end their bad run of quarter-finals to make it to their first-ever LIQUI MOLY EHF Cup Finals.